When it comes to mind-body exercise disciplines, any old mat won't due. Mats for yoga differ from Pilates in their thickness and density. Each is designed for the nature of the specific exercises. While you might be able to get away with interchanging the mats once in a while, if you have a dedicated yoga or Pilates practice, you want the right equipment. It'll make the exercises feel better and more effective. Many Pilates exercises require you to roll around on your back or tailbone. A standard yoga mat that measures 1/8- to 1/4-inch thick isn't usually enough to pad these sensitive areas. A Pilates mat, however, measures about 1/2 inch thick and usually features a denser, more compact foam, so it provides more support for your sensitive parts. For yoga, you want the mat thinner as it makes standing and balancing postures more accessible. If you're heading to a restorative yoga class, though, a thick Pilates mat is just fine. Thickness isn't the only measure of a good Pilates mat. The density of the foam used to construct the mat also counts. A dense, 1/2-inch mat will be supportive to your spine and provide firm support against a wood floor. A thick mat that's less dense may feel softer when you lay down at first, but will actually make some exercises harder because it offers less support, making it harder to balance on your sits bones or in plank, for example. Yoga mats' density depends on how tightly together its PVC foam is molded together. A dense mat is firmer and more stable. Budget mats are often less dense, and thus less supportive when you're balancing or seated. The vast majority of Pilates and yoga mats are constructed from a foam or PVC, a type of vinyl. 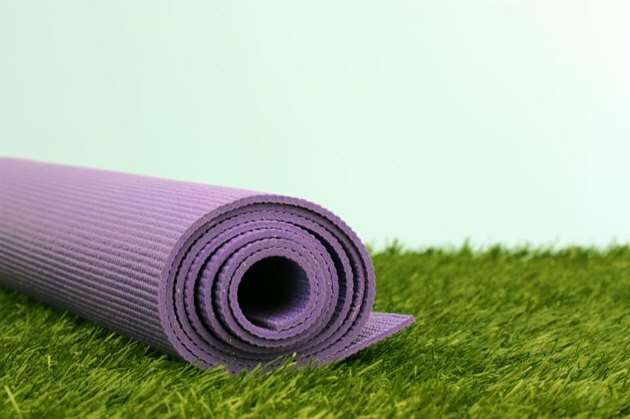 Some yoga mats are made from more earth-friendly products, such as jute or recycled rubber. This appeals to those yogis who want a product that's recyclable and better for the environment. Eco-friendly Pilates mats are also available, but less common. The standard yoga mat is 68 inches long and 24 inches wide. Purchase an extra-long mat, extending 72 or 74 inches if you're particularly tall. Pilates mats are generally the same length, but are sometimes a bit wider than a yoga mat to accommodate the greater variety of exercises performed on the floor. Yoga mats feature a nubby texture, which provides a sticky surface so you stay put in moves like Downward Dog or Warrior I. This stickiness isn't so important in Pilates and may actually impede movement in some exercises. A smooth surface on a Pilates mats allows you to glide while rolling like a ball or performing teasers.